In this tutorial, learn all about making your very first interactive chart. Click here to download the workbook with chart template and all the formulas. Refer to it while reading the article. There are several ways to make an interactive chart in Excel. You can use data validation, form controls, slicers, timelines, VBA or hyperlinks. In this tutorial, learn how to make an interactive chart with data validation and slicers. For other techniques, refer to resources section of this post. Making one chart with all of this is going to be very busy and hard to read. 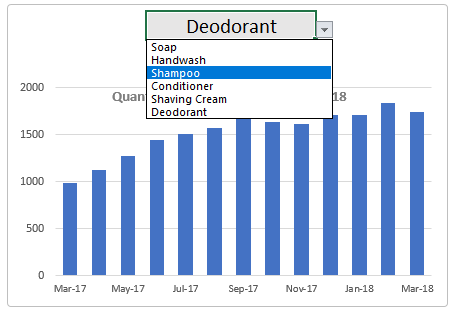 You want to make a dynamic or interactive chart so your boss can choose which product she wants to analyze and understand the order trend. Select all the product names and go to Namebox (top left corner) and type a name like products. Alternatively, you can also list the product names in a separate range and give that a name. Let’s say we have the products in the products name. Decide which cell will have the user selection. Let’s say this is Q5. 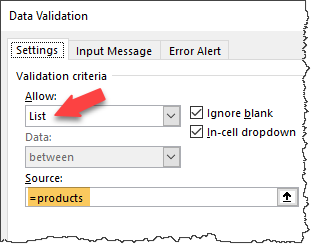 Select the cell and go to Data > Data Validation. Change validation criteria to Allow > List. Type products in the Source. Click ok.
Now, we have way to select product in the cell Q5. 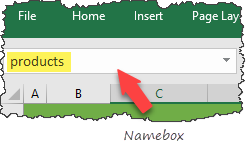 Related: Excel basics – How to setup in-cell drop downs in Excel. If we want the name of the product selected, we can simply use =Q5. For the rest of calculations, we need the number of the product (ie what is the position of the selected product in products). For this, we can use MATCH formula, like below. Type this MATCH formula in an empty cell like I3. This will return a number, matching the product user has picked. Now that we have calculated product quantity values for selected product, if you change I3, you will see values for the relevant product. Now that all the background work is done, let’s insert a chart. First, let’s add axis labels. Right click on the chart and go to select data. Edit horizontal / category labels and select the month column. Are you ready for the chart? We are almost done. We just need to bring everything together and our first interactive chart will be kicking and beating. Go to Insert > Shapes > Rounded Rectangle and draw a nice big rectangle around the chart and Q5. Remove fill color from the shape and adjust the line. Now, when you pick a new product from Q5, your chart will update. If you are too shy to INDEX + MATCH on weekdays, you can try the Pivot Table approach. This works very well and let’s you make equally amazing interactive charts. See below quick demo. Keep in mind that your data needs to get fit. Rearrange so it looks like this. If you need help, read: Unpivot data quickly with Power Query. 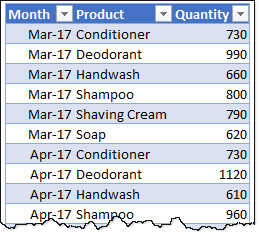 Select your data (month, product and quantity columns) and insert a pivot table. 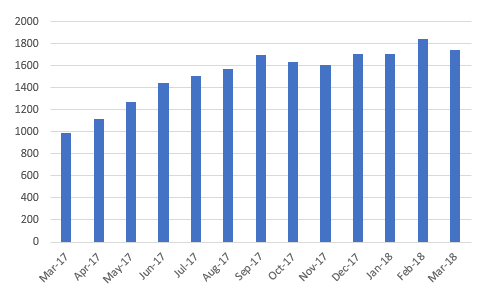 Add Month to row labels area. In newer versions of Excel, this will create date hierarchy – Year, Quarter and Month. If so, drop Quarter. Add Quantity to values area. Right click on Product and add it as a slicer. Select any cell inside the pivot and go to Analyze ribbon > Pivot chart. Select either a line or column chart. In newer versions of Excel, you can insert a pivot chart directly from data. But I find the pivot table first approach better as you can adjust items you want before charting. 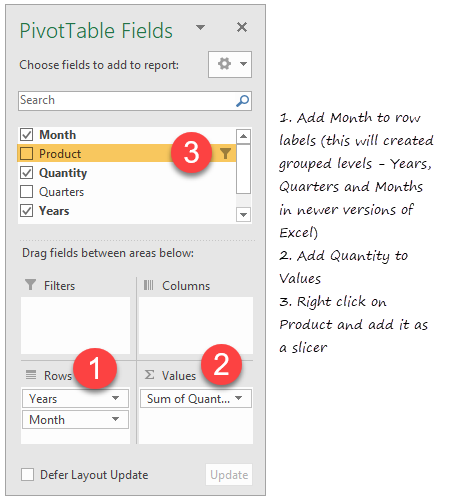 Select the pivot chart and go to Analyze ribbon and turn off Field Buttons. Replace chart title with “Total Order Quantity in last 13 months” or something like that. Set chart border to No line. Position the slicer adjacent to the chart. Our interactive chart is ready for play. Set limits on the vertical axis. By default Excel will change Y axis limits whenever your pick a product. 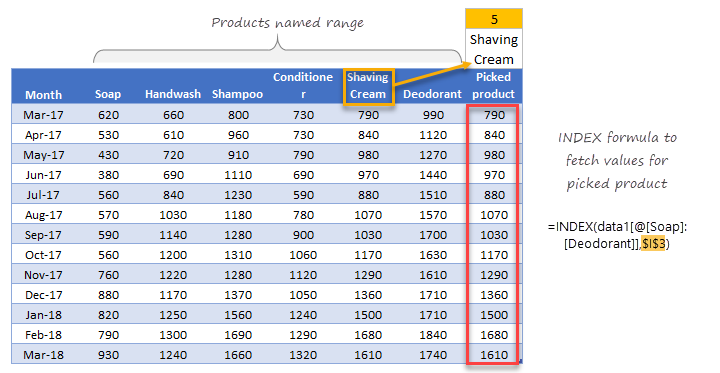 This can create some distortion of the numbers and confuse your users if they want to compare products. You can format the axis and set limits. Select the axis, press CTRL+1 and set minimum to 0 and maximum to highest possible value (rounded of course). For our example, this could be 2000. This way, only bar heights change, not the axis. Adjust gap width. Excel would pick some ridiculous value like 219%. Adjust this to 100% or something like that for less white space on the chart. To do this, click on the columns, press CTRL+1 and from Series options adjust the gap width. Check out below video tutorial to understand all these steps in detail. Make sure you practice by downloading the example workbook. Watch it below or on our YouTube channel. Please click here to download interactive chart workbook. Play with charts and examine formulas to learn more. Check out below examples to see what else is possible. What is your favorite way to make interactive / dynamic charts in Excel? I used to make charts with formulas all the time. But now a days, I prefer making them with pivot table + slicer route if possible. This reduces the amount of formula work needed and still gives awesome results. What about you? What is your favorite technique for creating interactive charts? Please share in the comments section. 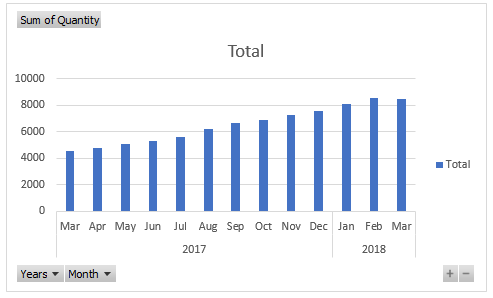 Similar to your Pivot Chart technique, I've created interactive charts using tables and slicers. Table slicers do not have to be on the same sheet as the table or can even be copied to another sheet. I also like using dynamic chart headers so if someone prints just the table, they know what the data refers to. I prefer a combination of it. Pivot Chart is good and easy to create. However it has its limitations, esp. on formatting. 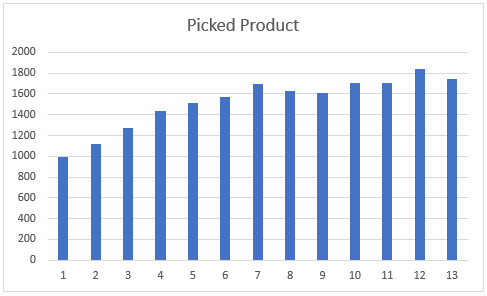 I used to create pivot tables to get the aggregation I needs; connect pivot tables with slicers; set up a table for charts with formula and GETPIVOTDATA. Then I can get more controls on the charts. Great tutorial samples excel based charts. Thanks for the guide. Very Informative article. keep on sharing such informative blogs. Thank you for your teachings and share your knowledge. This graph is excenete. Happened to find your website, thanks very much for your sharing you are a great teacher!